A few weeks back a friend and I went to Homestead Farm in Maryland for apple picking. I’m a huge (read: obsessed) fan of apples, going through a minimum of two a day, however this was my first time picking. Needless to say I went a little overboard and ended up with a 28 pound bag of Cameos, Pink Ladys (best. apple. ever.) and Sun Fujis. Now, 28 pounds is a lot of apples; stretching the limits of my fridge’s storage capacity (and my roommate’s patience with my obsession for food), so I decided to take full advantage of this by going into apple cooking/baking overload. We’re talking apple crisp, baked apples, apple honey challah bread, apple tarts…. These all had… varying levels of success. One of the things I have never done is a pie. My mom makes awesome pies. Growing up she’d always do at least two pies: one cherry for my sister and one apple for me (no, we didn’t eat the entire pie ourselves). I friggin’ loved those pies. So what better way to learn how to bake a pie than via the mom? So I took a trip down to Richmond Saturday to learn the art of pie making (and to make a potato gun with the dad, but that’s another story). One of the big things mom stressed was “reading the dough.” According to her, you have to be able to vary the recipe based on how things turn out. Maybe it’s a dry day and therefore the dough is dry, or maybe the opposite. Or maybe things just aren’t coming together, so you have to improvise. My mom uses a very simple recipe for pie crust; one she apparently got off a Crisco box (as a piece of the food snob in me dies to hear this). The apple pie filling? I have no idea. Peel and core the apples, cutting them in half then slicing them further; eight to twelve per apple. 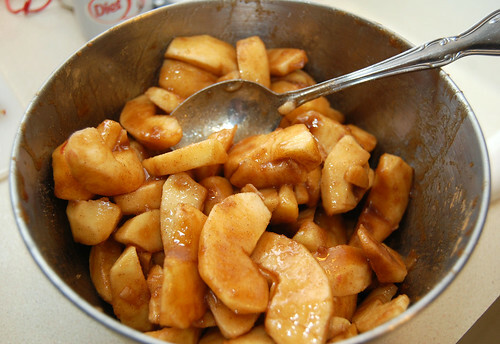 Combine the apples, lemon juice, white and brown sugar until apples are thoroughly coated. Let sit. Preheat the oven to 400°F and put a rack in the middle. Put the flour in a large mixing bowl and “cut” the shortening into the flour – meaning, cut the shortening into chunks instead of just dumping the whole slab in the bowl. Then using either a pastry blender or just some butter knives, cut into the butter until you get it a mealy consistency. Something like coarse cornmeal. Add the water one tablespoon at a time and get dirty. 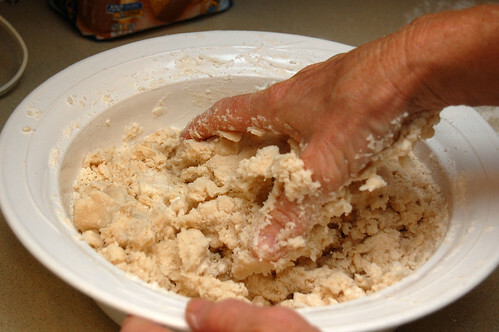 Mix the dough in your hand(s) until the dough is a bit tacky and sticks together. If too sticky, add flour. If not sticky enough (i.e., falling apart), add more shortening. If too dry, add water. Ask yourself what will happen if you try to roll this dough out and how it’s going to cooperate. 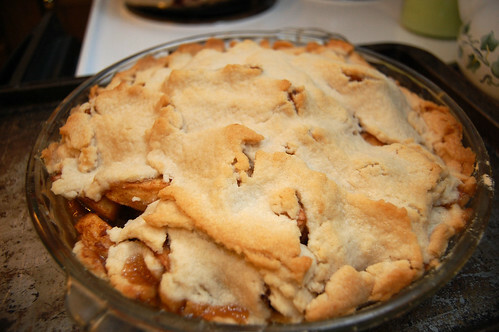 After you’ve “read” your perfect (::cough::) pie crust, divide it into two halves. Lightly flour a clean surface and roll out the dough. There’s a bit of flexibility on how thick you want this – basically, go for a diameter and two inches larger than the diameter of your pie pan (8-10 inches suggested for pan sizes). It’s better to have a crust that’s too large than too small. Roll from the center out, trying to get a uniform circle shape. The thickness doesn’t matter so much as the diameter. Carefully take your rolled out dough and transfer it to your pie pan. If it’s sticking too much make a mental note of this for next time, and use a pastry cutter as a quasi-spatula to separate it from your work surface. After this, fill your pie with the filling and repeat with the second half of dough. Make a few holes in the top of the pie crust for heat to escape. Put your pie in the oven and cook for 45 minutes. Remove when the crust is golden brown.